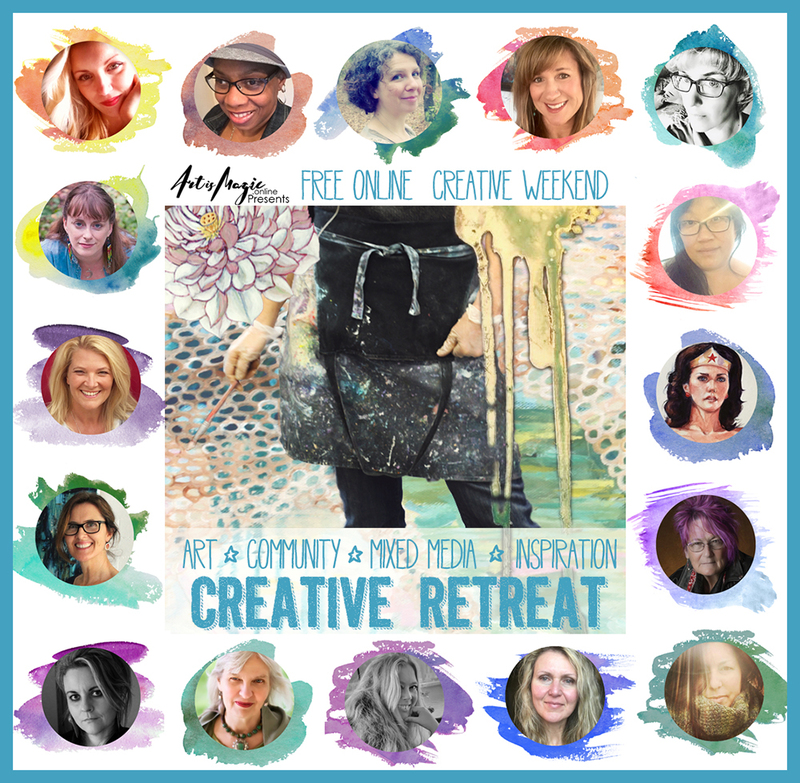 Join me and 15 other inspiring artists for a year-long online Creative Retreat! What I will be offering……. One hour long main lesson: One hour lesson on drawing, sculpting in clay and painting a mini botanical mandala wall hanging. This workshop is for anyone who creates or feels the desire to create, who wishes to be inspired, who wishes to explore with curiosity, who wants to play in the field of possibilities and dance with both the muses and their brilliance. This is for you brilliant creative soul, yes you. The free weekend we ran to launch this program is now over, but we’ve created the Ongoing Retreat Package so you can join us for one whole year! This includes extended access to the lessons from the weekend of the original retreat as well as a new lesson sent out weekly over the next five months (July onwards) with ONE YEAR ACCESS. Join us as we make Creative Retreat a practice to sustain our path, nurture our souls and support our creative unfolding. Each teacher will be offering a class designed to inspire and guide you through some creative play, art making and/or techniques. All these lessons will be available in the Ongoing Creative Retreat as well as bonus lessons from each of the teachers. In our second lesson (Day 2- Saturday) we will be taking the gifts of our mark making to the page and using them to create unique journal spreads full of our own art, our own expression, our own souls. What wants to be said beyond words. Painting faces is such a connective and creative process! I often begin with a reference photo and then my painting takes a wild turn somewhere along the way and I end up with a very different portrait than whathad initially imagined… I LOVE when that happens! Won’t you join me on a journeycreating colorful, expressive and exciting portraits? During this colorful adventure, I’ll share some of my favorite art making techniques and tips on color, expressive mark making, and how to manipulate photos in apps to generate fresh ideas for old and new paintings. I cant wait to share this journey with you! A guided creative journaling exploration to re-center, remember, reflect and rejoice in heart+soul truth. This lesson is inspired by core astrological energies unique to each of us. The beauty is that the personal meaning for you will come through – whether or not you know a thing about astrology or your personal chart. It’s the age of information. Sometimes too much information. Every day we are exposed, often overexposed to the human drama. It’s on a scale that’s bound to break even the most hardy of souls. Sometimes the drama most sure to break us, is our own. And we find ourselves dwelling in turmoil. What do we do when overcome with energy that drains us? We create another kind of dwelling, that in which to seek harbour. Join me for a creative approach to personal retreat. In this lesson I share with you one of my methods of doing this by just letting go and trusting the process. I hope to inspire you to “Break free” and create expressive, emotional portraits, much like in my class “The art of expression”. This lesson is born from my own desire to create a painting “just for me”, a personal, daily reminder of my own wings. I’d love for you to come along so we can fly together! Rituals are an underused superpower for artists, makers and creatives of all flavours. It’s scientifically proven that our brains are exceedingly receptive to ritual in all forms, and this can be astonishing fruitful when we apply ritual to our creative practice. Rituals can, among other things: help us overcome creative blocks, channel inspiration, help us choose which idea to pursue next, help us to make creativity a part of our daily lives, understand our fears around making and sharing our work, and make us more mindful and intentional with what (and how) we create. 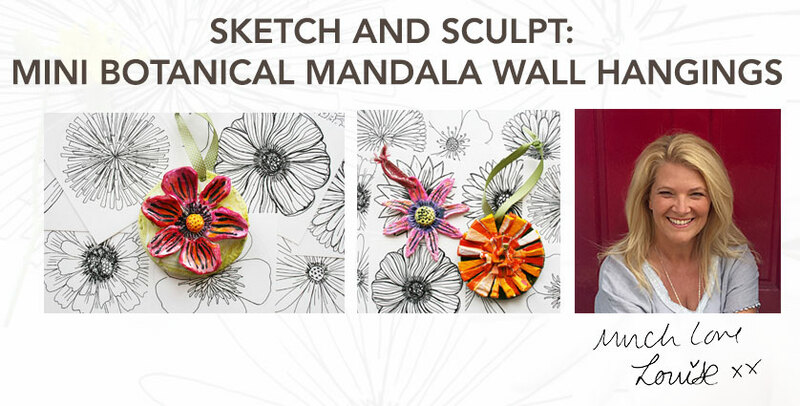 Presented by Louise Gale In this lesson, we will sketch two more beautiful flower designs which we will use for our air-dry clay ‘botanical mandala’ creations, then paint them using watercolors and acrylic paint. In addition, I have included a special meditation audio so you can relax, feel grounded and connect to a flower mandala design that is unique to you. Presented by Galia Alena In this lesson we will be taking ideas we explored in the previous lesson further to expand our own creative language of mark making and art making. Presented by Laly Mille This art is all about paying attention to light in your life, in your surroundings, in nature… and above all in YOU. Connecting with your inner light, so that you can infuse it into your art in your own natural and authentic way! The lesson contains: Video 1 “White Magic”: Is white really just plain white?… Experiment with different kinds of white to create a whole variety of white-on-white effects and add depth and light to your art. Video 2 “Soft Neutrals”: Here I’m sharing all my favorite supplies and materials to play with an infinity of neutral tones. From warm browns to moody grays and every shade in-between, they are one of my favorite ingredients to create soft, subtle moods. Video 3 “Dark Beauty”: Explore the richness of dark tones and create contrast that will make your light shine that much brighter. Presented by Katrina Koltes In continuation to my first lesson, we continue to explore the power of visual story telling through our art. Sometimes we have subconscious feelings we can’t really place, but are there nonetheless, weighing us down. When we begin to just let go, and play in our journal, not worrying about perfection, we leave space for those feelings to surface. I also believe that by using limited tools and color palette, again we can stay focused and let those emotions flow. Presented by Amanda Grace One of the things my students say about my teaching is that rather than learning a repertoire of technique (there is some technique of course), they learn how to open the portals of connection to the sometimes elusive, experiential self. To dive deep and surface with insights that connect them more deeply to their creativity, enabling them to express themselves in new and exciting ways. This is what I call ‘inhabiting’ the creative self. It’s a deeper, more intentional kind of attendance to the process. If this is something you yearn to experience, join me for this extended lesson in the Art of Dwelling. Presented by Jennifer Bonneteau As artists, we are always looking for new ways to push our work into new directions…new dimensions…new worlds. I have found that experimenting with color, shape and texture through the process of collage is one of the best ways to unlock new ideas and venture into exciting, unknown territories. In this extension of the Fantastical Faces lesson, we will be incorporating bits of origami paper, acrylic skins and metal leaf to add dimension, intrigue and shine to our pieces. CONTINUE YOUR CALM- PAINT, PLASTIC, SPLATTERS AND SPOONS. Presented by Denise Daffara This is a gentle exercise that can be ever so calming as you slow down to cut out the stencil… and then discover various moods glimpsed through the ‘limb shaped windows’ made by placing the stencil over your papers to see how they feel, in what ways do they differ from each other. Once the pieces are cut out, play with their placements to capture the essence you’re after. You might be surprised at how expressive they can be and feel. On a personal note, this was a very satisfying exercise to be with when grieving, at a time when words were few but these dolls spoke volumes in their gentleness. Presented by Eli Trier Creative fear is a tricky beast, and can show up in all sorts of unexpected ways. If you’ve ever suffered from perfectionism, procrastination, artist’s block, self-doubt, or resistance, then there’s a good chance you’ve come across creative fear. In this lesson, we’ll be exploring that fear and pulling all your creative monsters out from under the bed. Using journaling prompts and other exercises, you’ll be encouraged to unpack your beliefs around perfectionism and resistance, and reconnect with the reasons why you feel compelled to create. We’ll be chatting with our inner critics and finding out what they’re trying to protect us from, and we’ll be rekindling our love for the materials we use to create our art. (N.B. this lesson is part of Eli’s longer Make your Mark course). Presented by Lauren Rudolph In this lesson we will create painted studies of the nose and mouth. Both the nose and the mouth are filled with character and expression. They say so much with their form, highlights, shadows and hues. Small details once seen, contribute so much to the story of the portrait. Creating visual stories through the features is a lesson in pushing beyond and going deeper. Let’s tell visual stories through their exploration. Presented by Renata Loree We are all born under a different sun, moon, stars and planets and these energies pulls us sideways, straightways, up ways and down ways, sometimes it is hard to make sense of it all. We know we are all different, but we want to get along and love each other. The sign that you were born under was explored and mapped out for you many many moons ago and it reveals a lot about you. The ancients noticed that the seasons and moon cycles carried similar attributes that were worthy following to make their life easier. They also noticed that certain planet’s positions affected people and their affairs differently. In a way it is like traveling by a roadmap that points to who you are. All the things you were afraid of or hiding from until this moment might not be your fault at all, and if knowing that, you can have something to work with. You will gain understanding about yourself that will not only reveal your weaknesses, but also your strengths. In this lesson we will explore our Zodiac sign we were born under and create a visual painting with all it’s attributes. Presented by Catt Geller Cosmic Smash Booking personifies Art Is Magic! Making a Cosmic Smash Book pulls all of you in into the book. Every part of your senses become engaged in these highly personalized journals. I am going to show you how to enrich your journal processing in a way that deepens your existing work, help you find answers to questions that elude you, give you a place to ground when your feet are pulled out from you, give you a place to lay down intense feelings so you can get some space from them and create pages of joy that are uniquely you. Presented by Mindy Tsonas Falling into autumn is all about flowing with energy and emotion. You will receive 12 additional Alchemy Card prompts to move you into this juicy equinox season and help guide you during this time of wild transition and change. Presented by Chris Zydel Each and every one of us has a unique soul gift or a superpower that we have cultivated in response to what I am calling a sacred wound. Your sacred wound is a challenging psychological or emotional issue that you have struggled with for a long time and tends to trip you up over and over again. And because it keeps recurring, you have a highly developed a relationship to that issue. You understand it deeply. And sometimes, often without even realizing it, you have evolved wisdom strategies and healing tactics to deal with that wound. These strategies, tactics, gifts and superpowers are what I am calling your sacred medicine. Your sacred medicine is something that heals you first and then can be offered as healing for others in your family, circles of support and wider community. In this class we will be using guided meditation, journal prompts and art making to do the holy work of discovering the sacred wound and then using the same tools to name, claim and joyfully celebrate your sacred medicine. You will need an art journal, a pen, your favorite art materials and a willingness to dive deep in order to participate. I recommend having things on hand like oil or chalk pastels, colored pencils, paint or collage materials. Presented by Fonda Clark Haight Join me in this exploration of the internal world of emotion, imagination and art. Together we will explore techniques for getting in touch with your intuition and the subconscious messages and stories you can access, in order to know yourself, and add meaning to your art. These lessons will help you access that subconscious part of yourself that wants to be heard. The world of the imagination and the heart are such a rich, deep inspiration, not only for your artwork, but also for your journey thru life. Presented by Hali Karla Using simple reflective prompts, you will reflect and honor how you relate to your matrilineal lineage stories and what ‘Grandmother energy’ means to you and your life’s journey. Then, you will explore intuitively, through a guided visual exploration in your journal pages, to awaken meaningful connections, new insights and a deeper curiosity and sense toward your place in the unfolding flow of feminine wisdom and wonder. (NB. – this lesson was originally available in Spectrum 2015). Ready to sign up to the ‘Ongoing Retreat Package’. You will get all 16 classes + 16 bonus classes + downloads AND ONE FULL YEAR access to all content for only $147. Pay and Register NOW! REMEMBER: When you sign up to the online retreat HERE, you get all the original lessons, gifts AND bonus lessons from everyone! For one whole year of access for only $147!